There really isn't anything sweeter than lazy Summer days with my kiddo's. We have been spending most of our time over the last two weeks outdoors in the sunshine playing, and at the pool. My older two children are also steadily making their way through their Summer reading lists, and the Disney "The Never Girls" book series has totally captivated the attention of my 7 year old daughter. The story-line follows 4 girls as they adventure into the world of the Disney Fairies. This is definitely a series to check out if your daughter's are into fairies and are currently reading at a chapter book reading level. As The Never Girls books have reignited my daughter's love of everything Fairy related, I decided to do a fun little craft with her yesterday. 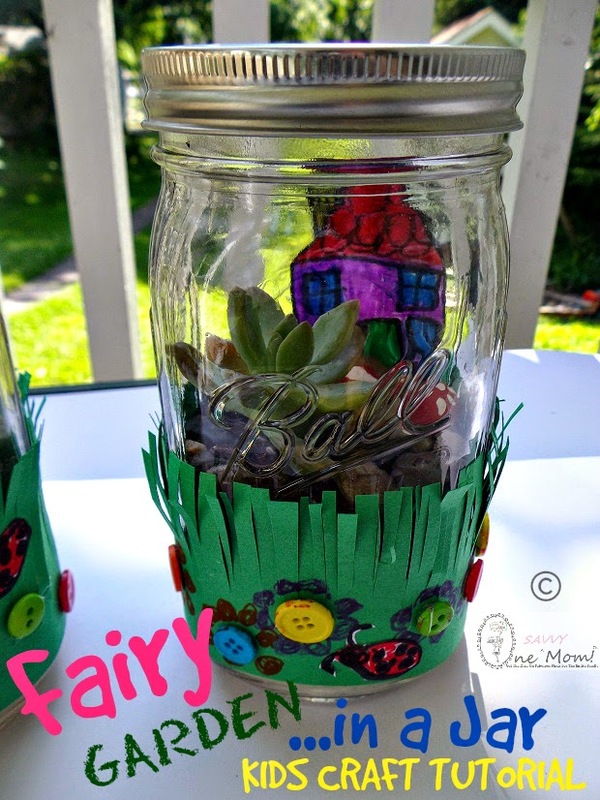 She made this super-cute Fairy Garden in a Jar, using a Ball Mason Jar, a live succulent plant and a few other simple supplies. 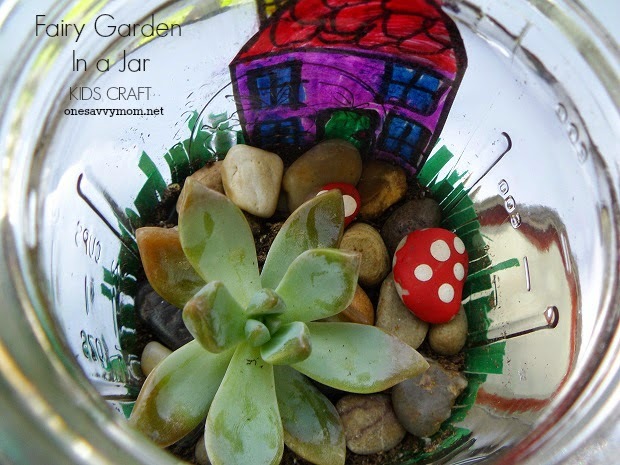 This is such a cute little terrarium and needs very little maintenance. Simply add a small amount of water with a dropper every few weeks, place the lid on the jar and keep it in a fairly sunny spot. 1 1/2 cups of potting soil + mixed with 1 teaspoon activated charcoal (great for keeping terrarium plants healthy). Fill the mason jar with half of the potting soil - place succulent plant in and use the rest of the soil to fill in around the plant). 1 Elmer's Glue Stick (clear formula) - to affix "grass" and the Fair House to outside of Mason Jar. 1 piece of green construction paper (cut a 3" w x 10" L strip and fray it to create the grass for your fairy garden - see image). Affix to the outside bottom of the mason jar as pictured. 1 piece of white paper to draw a small fairy house (see image) - Affix to the Outside of the Jar using Elmer's Glue stick. Make sure that the picture is facing in so you can see it through the jar. 5-10 colored buttons (to create "flowers" in the grass on the outside of the jar - affix with heavy craft glue or low-temp hot glue - optional (see image).